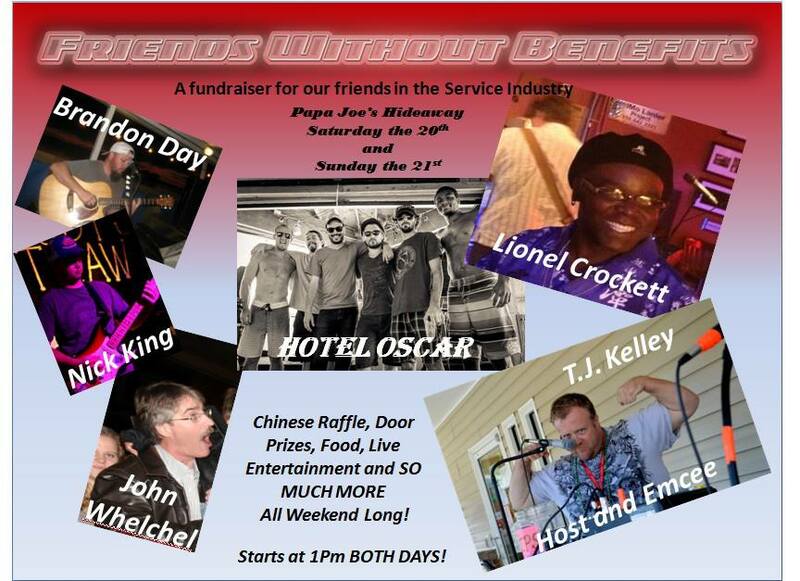 This Saturday and Sunday (July 20 & 21) there is a benefit going on at Papa Joes Hideaway in Ft Walton called Friends Without Benefits. The event is to raise money to help offset some costs of two locals medical bills – they are currently battling cancer. Although they are struggling with different types of cancer, both are extremely challenging and very costly. Financial support is of the utmost importance, enabling them to pursue options and opportunities to help mitigate the disease. “Pineapple” Pete Kauppi and Nikki Ballard. Nikki Ballard is a bartender at Helen Back and is battling breast cancer for the second time. “Pineapple” Pete Kauppi is a local patron of Papa Joe’s Hideaway and husband of daytime bartender Mary. He has contributed his time to the construction of Bob Hope Village and the construction of Pineapple Pete’s, the deck side lounge at the Crab Shack on Highway 98. Music includes Brandon Day, Nick King, Lionel Crocket and Hotel Oscar. This entry was posted on July 18, 2013 by 850music in Posts and tagged press release.